Many visitors fly to Alaska, but the magic of the north doesnt begin at the state border. The Canadian provinces of Alberta, British Columbia, and the Yukon offer wildlife, scenery, and history of their own, as do the states of the northern and western United States. Because of this, others make the excellent choice of reaching Alaska via the Earths surface. It can be done by car, bus, ferry, and, in part, by train. These four modes of transport may be combined in several ways. Alaska is best appreciated when you sense its remoteness by taking the long road to get there. When it was first constructed in 1942, the Alaska Highway (once known as the Alcan) was a slow, gravel road, intended for military convoys and supply trucks. Roadhouses and service stations were few and far between. Travelers needed to carry extra gas cans, two or more spare tires, and survival gear. Various screens and panels were used to protect headlights and windshields from destruction by flying gravel thrown up by passing trucks. Personal vehicles ready for an Alaska journey often resembled a cross between an armored personnel carrier and the Beverly Hillbillies truck. Today, the primary route to Alaska is all but completely paved. Nowhere will you have to go more than a hundred miles between fueling points (except at night and in the winter). On many segments, tight curves have been smoothed and lanes have been widened. The traffic is thick enough with good-hearted people that your chances of getting stranded are slim. For a long time, the Alaska Highway was the only driving route to Alaska. Today its possible to drive to Anchorage almost completely via alternate and equally wonderful routes, all of which offer plenty of scenic beauty and long miles. "Progress" aside, a drive to Alaska should not be taken lightly. The miles are long and still quite empty. Carrying two spare tires (or at least a can of a fix-a-flat product) and a 5-gallon gas can is prudent. A heedless moose can still trundle onto the road and end your trip. Perhaps the biggest consideration is the amount of time it takes to reach Anchoragefour long days from Seattle, eight from Miami. If you plan to drive round trip, youll want to allot at least three to four weeks for the whole journey. Not much changes when you reach Alaskaexcept perhaps that you drive a little more slowly and stop more often. There are numerous towns and roadhouses that offer lodging. An extensive network of state recreation sites and areas offers public camping, as do the larger parks and private businesses. Highway services and vehicle repair are found at reasonable intervals on main routes. Just never forget that you are in Alaska, and that an 800-pound grizzly is no friendlier looking for a burger in a campground than it is in the middle of nowhere. Keep a clean camp and watch your pets and kids. You may want to put a ferry link into your car tour. 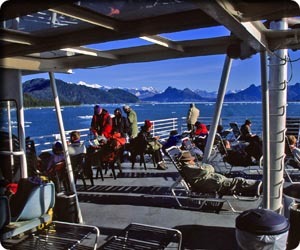 In the Southeast, the mainland highway system connects with the Alaska Marine Highway System ferries in Prince Rupert, Hyder, Skagway, and Haines. Prince William Sound, the Southwest, and the Aleutians can be accessed from Valdez, Whittier (via the train shuttle), Seward, and Homerthough theres little reason to take your vehicle to the Southwest. A new once-a-month ferry now links the Southeast with Prince William Sound and points west. You can rent cars in many places, but the option is particularly valuable away from the main highway grid in places with small road systems like Ketchikan, Kodiak, and Nome. Some travelers fly to Anchorage and rent a car or small RV. See the appendix for rental-company listings. Alaska Airlines is the primary carrier serving Alaska. Numerous routes link all of the important towns and cities within the state, while several flights daily connect Alaska with points throughout the western United States. Teamed with partner Horizon Air, excellent connections are possible to and through Alaska from scores of points throughout the west. Alaska Airlines also offers a variety of tours and packages, including a number of excellent winter options. Visit www.alaskaairlines.com or call (800) 426-0333 for reservations and information. The best routing and scheduling from the midwestern and eastern United States is offered by Northwest Airlines, www.nwa.com, (800) 225-2525. Northwest and partner KLM have great international routing, while Alaska, Horizon, Northwest, and KLM also have a frequent flyer mileage-sharing agreement. Other carriers with a flight to Alaska include Delta, United, and Continental. Reeve Aleutian Airways makes a great alternative for flights in the Southwest. PennAir, Era, and smaller companies complete the picture (see the Appendix for complete listings). Rail travel has always been a favorite of mine. Gaze out the window as you relax with a sandwich and cool drink in the lounge car. The world rolls by outside as the rhythmic rocking and clacking melts anxiety to nothing. Though you cannot travel by rail all the way from the lower 48 to Alaska, there are several links that can be incorporated in a larger scheme. Amtrak routes can be linked with Canadian rail routes at several points. From Seattle, the Mt. Baker runs once-daily to Vancouver, as do three Amtrak Thruway buses. All stop in Bellingham, enabling rail travelers to connect directly with the once-weekly ferry to Ketchikan, Juneau, and other points. From the Rockies and upper midwest, you must put a bus link in your itinerary to hook up with Canadian trains, perhaps motoring from Shelby, Missouri, to Edmonton, or Grand Forks, North Dakota, to Winnepeg. U.S. Canada rail connections in the east are possible from New York to Montreal via the Adirondak, from New York to Toronto via the Maple Leaf, and from Chicago to Toronto via the International. All run once-daily; other connections are possible by including an Amtrak Thruway bus link. Call (800) USA-RAIL for information, or visit Amtraks website at www.amtrak.com. Canadas VIA Rail offers the Canadian, which runs three times per week from Toronto to Vancouver, passing through Winnipeg, Saskatoon, Edmonton, Jasper, and Kamloopsthough not Calgary on the way. Call (888) 842-7245 for Via Rail bookings (free call), or visit the Via Rail website at www.viarail.ca for information and reservations. VIA Rail offers the Skeena through Prince George to Prince Rupert from the junction with the trans-Canada line in Jasper. B.C. Rails "Caribou Prospector" runs from North Vancouver to Prince George, (800) 663-8238 outside B.C., (800) 339-8752 in B.C., www.bcrail.com/bcr. The two trains only run three days a week, but have coordinated schedules enabling an efficient trip between Vancouver and the ferry connections at Prince Rupert. Trains leave Sunday, Wednesday, and Friday morning for the 36-hour trip, including 10 hours for an overnight and train switch in Prince George. The Caribou Prospector one-way fare is $200 including meals, while the VIA train from Prince George to Prince Rupert is $70 to $90 economy and $190 "totem class" including meals. The tracks of the Alaska Railroad run from Seward to Fairbanks. Every morning from mid-May to mid-September, a train departs Fairbanks for Anchorage, and Anchorage for Fairbanks, both stopping along the way in Denali Park, Talkeetna, and Wasilla. Several other flag stops are possible. The one-way fare from Anchorage to Denali is $102 ($84 in shoulder season). Anchorage to Fairbanks is $154 ($120 shoulder), while Fairbanks to Denali is $54 ($44 shoulder). Both trains depart at 8:15 a.m. and arrive at 8:15 p.m. The southbound Coastal Classic departs Anchorage for the 4 1/2-hour trip through Portage to Seward at 6:45 a.m. It then departs Seward for the return at 6 p.m. ($50 one-way, $86 round-trip). The same train becomes the Seward Swing for a midday Seward-Portage-Seward round-trip (departs 11:30 a.m. from Seward, 2:45 p.m. from Portage; $34 one-way, $60 round-trip). A new train, the Glacier Discovery, departs Anchorage for Whittier at 9 a.m. (departs Whittier on the return at 5:45 p.m.; $26 one-way, $52 round-trip). With the opening of the new road, the auto-shuttle trains between Portage and the ferry pier at Whittier are ceasing regular operation. For further information contact the Alaska Railroad Corporation, 411 West 1st Avenue, Anchorage, AK 99501, (800) 544-0552, 265-2494, www.akrr.com, reservations@akrr.com. Greyhound can connect you via any number of routes in the United States and Canada, getting you as far as Whitehorse in the Yukon, or Prince Rupert, British Columbia. From Prince Rupert you can catch an A.M.H.S. ferry, while from Whitehorse, the Yukon & White Pass Railroad offers a bus/train trip to Skagway (see Skagway in chapter 7); or you can connect with Gray Lines Alaskon Express (see below). Greyhound offers a variety of packages and passes that might save you money. For information and reservations for the United States and Canada, call (800) 231-2222 or visit their website at www.greyhound.com. For information on Greyhound Canada alone, call (800) 661-8747 or visit the Greyhound Canada website at www.greyhound.ca. Greyhound does not serve Alaska; however, Gray Line of Alaska, (800) 544-2206, carries fare-paying passengers as well as the package-tour variety. Their Alaskon Express buses run from Skagway or Haines to Fairbanks or Anchorage for around $200less for points between. Eastbound buses leave at 7:30 a.m. on Sunday, Tuesday, and Friday; westbound at 7:30 a.m. Sunday, Tuesday, and Thursday. The buses stop for the night in Beaver Creek (accommodations extra). Alaskon Express can be linked with Greyhound in Whitehorse. For connections to the B.C. Ferries terminal in Port Hardy or B.C. Rail Station in North Vancouver, contact Greyhound. The best way to travel to and through coastal Alaska is undoubtedly via the ferries of the Alaska Marine Highway System. You can catch the ferry in Bellingham, Washington, 80 miles north of Seat-tle, for a three-day ride to the highway connections in Haines or Skagway. Many people who drive to Alaska catch the ferry in Prince Rupert, B.C., thus saving some money and enjoying British Columbia by road. In May of 1998, the A.M.H.S. initiated monthly service between the Southeast and Prince William Sound, making it possible to travel by sea all the way from Bellingham to Unalaska and Dutch Harbor in the Aleutian Islands. The ferry is a great alternative to cruise ships and tour boats. Though ferries dont normally go out of their way for scenic spots, there are some notable exceptions. In the Southeast, ships pass through several narrow channels where seals, otters, eagles, and porpoises can be seen. In Prince William Sound, the Valdez to Whittier route stops in the mouth of Columbia Bay for a long look toward Columbia Glacier. Almost anywhere along the ferry routes, captains will point out whales and other wildlife sightings, occasionally shifting course or slowing down to allow better viewing. Budget ferry travelers can buy a basic fare, then sleep in the recliners, on the floor, orbest of allon the upper deck under the stars or in the solarium. Deck chairs fold flat into comfortable cots. Just position yourself away from doors and foot traffic and let the thrumming engines ease you to sleep. Some of British Columbias coastal B.C. Ferries routes might be of interest. A ferry leaves Port Hardy on Vancouver Island for Prince Rupert every other day while the A.M.H.S. from Bellingham only runs once a week. Port Hardy can be reached via Greyhound from Victoria (see Bus Travel, above). Victoria, in turn, can be reached by B.C. Ferries from Vancouver or private service from Seattle. It should be noted that Victoria is one of the most wonderful cities on the continent and is worth a day or two itself. Call (604) 669-1211 for B.C. Ferries information and reservations, or visit their website at www.bcferries.bc.ca. The rhythms of the Far North reach extremes that distinctly shape the travel and tour season. In May, young people begin arriving to work in the many businesses that are all but closed through the long winter. Most climbers schedule summit attempts in May and Junethe short window between winter weather and avalanche season. Booking for cruises, ecotours, scenic flights, ferry tickets, and hotel rooms rise and fall in a bell curve, starting from near zero in early May, peaking to sold out in July and August, and dropping back to nothing by the end of September. If you wish to fish (or to avoid the fishing crowds), early- to mid-summer weekends are prime times and the Kenai Peninsula is the main location. These are also good times to view bears that concentrate along certain falls and cascades to enjoy their own salmon harvest. To avoid active hunting, inquire about the carefully managed seasons, most of which occur after August. Though almost all highways to and through Alaska stay open year-round, harsh conditions and the closure of many roadside businesses make off-season driving in several areas problematic. The ferries run less frequently from fall through spring, and most backcountry lodges are boarded up seven or eight months of the year. Flightseeing companies shut down and bush pilots face harsher conditions. Travelers can face difficult weather in the off season, but the most noteworthy feature of the winter months is that it gets dark! On Sep-tember 22, every place on Earth has a 12-hour day and a 12-hour night. On September 23, Fairbanks has 11 hours and 53 minutes of sunshine; on the 24th, its 11 hours and 46 minutes. Hang around for nine days, and you lose an hour! By the time the winter holidays roll around, the sun in Fairbanks makes only a reluctant appearance, teasing the hem of the sky from about 10:30 a.m. to 1:30 p.m. then disappearing again. The lingering dawn and twilight are little consolation. Only the rare traveler will opt to experience Alaskas winter wonders, but it might be wise for all visitors to avoid the tour-heavy months of July and August. Consider the shoulder season for your visit, particularly the late summer and very early fall. In early September, availability of rooms and tours is on the rise and prices are dropping. Ferries and flights into the state are easy to book. The mosquitoes and the other biting bugs are fading fast, and the fall colors in parts of the Southcentral and Interior regions are spectacular. Areas where hunting is in progress are poor choices for backcountry exploration at this time, but most of the national parks and many other key destinations are free of the activity. Beyond the most obvious itemscamera and binocularsfunctionality should take precedence when packing for an Alaskan journey. Highly variable weather conditions and the wide range of possible outdoor activities call for a broad but thoughtful approach. Although Alaska has civilized centers of population, it can often be inconvenient and sometimes impossible to find a needed piece of equipment. Smaller towns have more available than you might expect, but key items may be out of stock for days at a timeespecially if supplies arrive only by air or sea. If you are planning to get completely away from supply points for a time, youll want to plan with great care. Make sure you know exactly what a guide or outfitter supplies. Check with backcountry lodges about what you should bring before you climb into the bush plane. Self-contained backpackers and kayakers should use a comprehensive checklist to assure preparedness. Alaska can be wet, windy, and chilly at any time of the year. Choose activity-related gear that is rugged and casual. Very few establishments expect any kind of formal, or even business-level, garb from their patrons. Scuffed boots and grubby Gore-Tex are de rigueur in the finest hotel lobbies (both of them). The best approach is to think in layers. Have a fleece to go over your flannel when the wind blows and a waterproof jacket to go over the fleece when its wet. If youre pushing the edges of the travel season, or planning high-altitude or Far North travel, add another warm layer, plus gloves, stocking cap, and long underwear. In the summers, expect rain at anytime along the coast and in the mountains; moderate temperatures near the sea; extended warm spells in the Interior; wind in the Aleutians, Arctic Coast, and North Slope; and crisp nights everywhere. Alaska is at its best when the weather is wild. Pack smart so you arent driven indoors against your will. On the other hand, the summer can bring hot weather. Consider, too, the lowly mosquito and its various biting cousins, including flies, gnats, and no-see-ums. They appear in the spring and fade in the fall, but seem to rise from the dead to find your exposed skin, even in the off season. Theyre found everywhere in Alaska, except over snow and ice, though theyre densest in or near boggy areas. Baggy pants and a loose, long-sleeved shirt over a T-shirt provide good protection. Long hair and a hat help head and neck, as does a careful dose of DEET. Some folks like a hat with a veil of mosquito netting. Other swear by Avons Skin-So-Soft as repellent. Alaska has no ticks, poison ivy or oak, dangerous spiders, or snakes (or any reptiles for that matter). Footwear is very important. Hiking boots are a good choice. Both on and off trail, wet, boggy, and muddy conditions are commonfully waterproof rubber boots or a pair of waterproof hiking boots should be basic gear. At the least, plan on maintaining the water-shedding qualities of your boots with appropriate surface treatment. A second pair of walking or athletic shoes are good for general knocking about. Backpackers may want to carry Tevas or another type of rubber sandal for crossing the many streams and rivers. Gaiters keep mud and debris out of boot tops and keep pant legs dry. Selecting camping gear involves three notable considerationscold, wet, and mosquitoes. When deciding what to pack, make sure you have adequate protection against all three. Cold is the toughest thing to plan for, since it may not becold, that is. Every night of your five-day trek through the Alaska Range may be mild, even balmyor may not. When combined, your tent, sleeping bag, pad, and clothes should be warm enough for 30°F to 40°F nights, even in mid-summer. On the other hand, a well-ventilated tent and light, breathable bedding can enable a good nights sleep when its warm or rainy. Car travelers can pack a variety of stuff; backpackers should plan carefully. Preparing for rain and dampness shouldnt be taken lightly. If you and your gear get wet on a long hike and the evening turns chilly, anything from discomfort to hypothermia can result. At the least, make sure that you can get into a dry sleeping bag that will stay dry throughout the night in a tent or bivvy sack. Better yet, make sure your headgear, outerwear, footgear, and pack cover all repel water efficiently. Be prepared for a little gnat known descriptively as the no-see-um. Old-style netting, as well as the screening and netting still found in some vehicles, cheap backpack tents, and family-style tents will not keep them out. Make sure that there is a layer of no-see-um netting between your sleeping skin and the world outside. The other thing to be aware of is the sly speed of mosquitoes. Crack a car window for 30 seconds to take a picture and 20 relentless mosquitoes might slip in. Make sure to keep your tent screening closed completely and at all times so you dont spend your first night-time hours hunting the villains with a flashlight. A fourth consideration is specific to certain regions, but is nonetheless vital: wind. Winds can be fierce enough to blow down many types of tents, as well as blow body heat away and rain into your sleeves. The best-known wind areas are the exposed, relatively flat areas of the ocean coasts (Aleutians, Arctic Coast, North Slope), high mountain areas, and certain other areas where sweeping slopes, valleys, and lowlands seem to concentrate the breeze, particularly in non-forested terrain. Consult the appropriate area expert when devising backcountry and sea-kayak routes. Make no mistake, travel to and through Alaska is generally more expensive than anywhere else in the United Statesin part because the cost of living is among the highest, but mainly because most tour and travel options are logistically "big." The next destination on a high-budget itinerary is often many miles from the previous place, and your group has to fly there and back in a plane that costs $300 per hour. Food, lodging, and provisions in remote locations can rise in price to double what youre used to (and beyond). If money is an issue and youll be covering a lot of miles, plan your itinerary one fare, fee, and rate at a time. The flip side of this is that Alaska is a great place to just "be." If you stick around a town or park for a few days, the cost of moving around is diminished. In the heavily traveled areas of the state, food and lodging may actually seem cheaper because so much of it is rustic. Along the highways, hitchhiking is easy (though not officially endorsed by this author), camping ranges from free to competitive, gas and groceries are 10 to 20 percent above average, and park admissions are the same youd see anywhere. If you stay out of small planes and near the road, you can stretch those dollars with great success. There are numerous opportunities for those who want to work to support their trip. The jobs tend to be menial, but pay relatively well. Fish canneries, for example, are always looking for people (in season). See the appendix for state and local information contacts. The bold might consider a better-paying job working on a fishing boat. Openings, however, can be hard to find. Statistically, crewing is also by far the most dangerous of all seasonal work and the quality of employers varies widely. The major hotel and tour companies hire many employees for the summer. One of the biggest concentrations of jobs is in the "town" of McKinley Parka short commercial stretch along the George Parks Highway a mile north of the Denali National Park entrance. Princess Cruise Lines and Aramark both operate large hotels, and there are several smaller operations. Summer employees receive low wages for various types of unskilled and semi-skilled work. Cheap room-and-board contracts are offered. There are several advantages to working in the tourist industry. Some jobs are interesting, such as assisting with rafting trips or crewing on a tour boat. Many young people and outdoor enthusiasts are concentrated in tourist areas as employees, thus providing great opportunities for friendship, adventure, and partying. Volunteering and service opportunities also exist. The great advantage of maintaining a trail, assisting in a native village, helping on an archaeological dig, or teaching with Elderhostel is in the people you meet and work with. 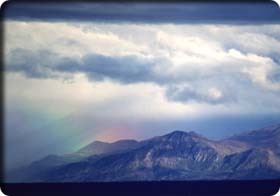 A truly unique blend of ownership, land use, and surface and mineral rights is found among the public lands of Alaska. Many designated federal areas are shown on maps as contiguous, but in reality have significant inclusions of private, state, or native lands. This is particularly true of certain national wildlife refuges, most notably the Yukon National Wildlife Refuge, which includes vast tracts of native corporation lands. Though the lands are so wild and empty as to make the point almost moot, travelers should not expect all public land areas to be pristine, or even unpopulated. National preserves are almost unique to Alaska. The designation was created as way of adding and expanding national parklands while maintaining traditional use patterns. Many things are allowed in preserves which are generally forbidden in parks, including hunting and motorized-vehicle access. In fact, other than enhanced management and administration, nothing has really changed on many of these lands. Indeed, subsistence hunting is still allowed in certain parts of national parkssomething you would never see in the lower 48. Designated wilderness areas are found in national parks, preserves, wildlife refuges, and forests. Here again, the designation often means something very different than what it means in other states. Hunting is often allowed, as are certain types of motorized-vehicle access. Cabins and a few backcountry lodges are located in a number of wilderness areas. Again, expect the boundaries on the map to mean less in Alaska than they may elsewhere. grade chain or independent motels are found in Anchorage, Fairbanks, Juneau, and a few other large towns. Smaller communities and tourist centers generally feature independent accommodations that are basic at best, though Alaskan moteliers keep the sheets as clean as anywhere else. Reservations are strongly recommended statewide during July and August. The rate ranges described in the listings were accurate at the time of publication. Note that many areas have additional bed taxes of up to 10 percent. In remote locations and areas where seasonal workers need housing, you may find lodgings that utilize "Atco units"essen-tially pre-fab boxes akin to mobile homes. Atco units are delivered to remote locations by truck, ship, and even large snowmachine. They can be linked like dominoes and even stacked to provide the basic cubic footage that can then be jazzed up into a motel. Alaska has, perhaps, more bed-and-breakfast choices per capita than anywhere else in the nation. Many B&Bs are family homes, operating only during the travel season. Most are rustic or "family-style." Commonly, only one or two rooms are available, and guests may cross paths with junior and the family dog. Because of the sheer number of B&B offerings, especially in popular destinations, chapters include a central reservation number wherever B&Bs have banded together. For a true Holy Grailtype quest, try looking for fine cuisine in the 49th state. The restaurants in Anchorage and Juneau aside, your finds will be truly rare. Even in the major centers, the best of the best would be no more than average elsewhere. As for most roadhouse-grade grub, it hearkens back to the Route 66 truck-stop fare of yore. On the other hand, the splendid simplicity of hearty food fits Alaska perfectly. Once common along Alaskas transport routes, roadhouses offered travelers every needed service under one roof. Lodging, a bar, a restaurant, a store, and later, gas, were typically available at these isolated, oases, often located an average days travel from one another. While todays "average days travel" makes many roadhouses obsolete, they persist in both actuality and spirit throughout the statethough the word "roadhouse" may not appear on any sign. There are still many towns shown on the map that are no more than a roadhouse with a few scattered homes nearby. Youll see the sign and wonder whats up. Yes, the salmon is hot and ready, as typically are halibut, ribs, and other goodies. The mood is often rustic, almost picnicky, with heaping side dishes youd find at a family-reunion potluck. The fixed price includes the workseven soft drinks, coffee, or tea.